Detta är ett fast objektiv som tillverkats av Canon och modellen lanserades 1998. Om du köper detta objektiv följer det med ett motljusskydd, vars modellbeteckning är "EW-78C". Detta är ett vidvinkelobjektiv i L-serien för yrkesbruk med den stora maximala bländaröppningen f/1,4 och en asfärisk lins för extra hög bildkvalitet. Det flytande optiska systemet bevarar kvaliteten på alla fotograferingsavstånd. Den snabba och tystgående autofokusen arbetar med innerfokusering och en ringformad USM. Du kan alltid justera fokuseringen manuellt utan att koppla om objektivet." Text från Canon: "L-series professional f/1.4 wide-angle lens with an Aspherical lens element to correct aberrations. The floating system enables high picture quality to be obtained over the entire focusing range. Autofocusing is quick and quiet with rear focusing and ring USM. Full-time manual focusing is also possible. 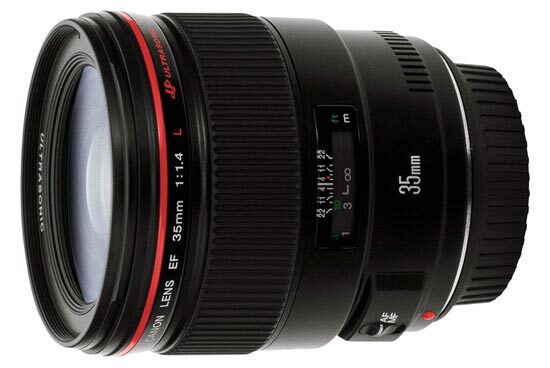 This 35mm L-series lens boasts the brightness of the largest aperture in its class and unrivaled natural delineation. A ground and polished aspherical glass lens element (9th) thoroughly eliminates spherical aberration and distortion. It achieves extremely sharp, faultless image quality only possible with a single focal length lens. A floating mechanism in its optical system corrects all aberrations in the medium and near focusing distances to maintain the lens´ super image quality from the closest shooting distance of 0.3m to infinity. The AF drive system features silent, high-speed AF using rear focus system and a ring USM (Ultrasonic Motor). A wide focus ring permits smooth full-time manual focusing. The non-rotating filter frame affords easy use of circular polarizing and other type of filters. All eleven lens elements are made of environment-friendly lead-free glass."